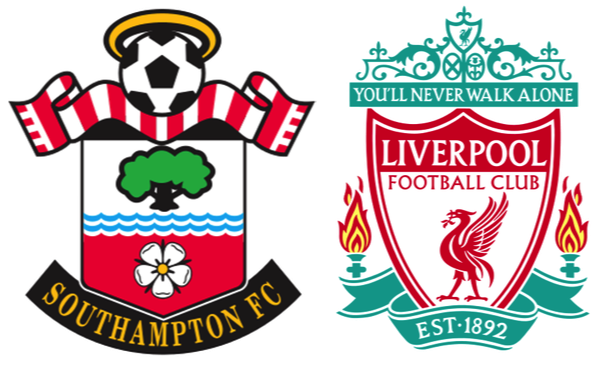 Some weeks ago my ex-boss got some tickets for this game for himself (a Liverpool fan), his father (a Spurs fan) and his son (wavering from being a Liverpool fan to Saints one). I was at the far end of the pitch from all the fun in the Liverpool penalty area, but was unfortunately perfectly placed to see Coutinho's wonder strike for Liverpool's first goal in the third minute. Apparently, according to both my ex-boss and his father, Saints should have definitely had at least one penalty after the goal. His father, the Spurs fan, reckons we should definitely had at least two penalties, either side of the goal and that could well have put a completely different complexion on the game. We were however, all in agreement that the ref didn't have a good game. As it was, Saints had to chase the game from then on and for a team that is having some difficulty in even scoring one goal, that was really bad news. The eight goals scored against Sunderland seems such a long time ago. This was the result that I was dreading. Once again Saints dominated all the measurable stats, other than in goals scored. There was a frenetic opening period which saw two clear penalty claims, both involving Filip Djuričić, who looks a real livewire, but one lacking stamina and match fitness, of which more later. There was also the stunning strike from Coutinho which gave Forster no chance at all. Thereafter Liverpool never really threatened until the dreadful mixup leading to the second goal in the second half. I also cannot remember a game for some time where the weather was so absolutely appalling, with continual driving, freezing rain for the entire match and yet it wasn't until the otherwise impressive Targett slipped, leading to the second goal, that anyone put a foot wrong. A credit to both sets of players. The game started with Mané relegated to the bench and Djuričić starting in his place, as the Senegalese was penalised for being nearly half an hour late for the pre-match meal. As it turned out, the Serbian had an immediate impact on the game, being involved in the two penalty incidents in the first five minutes. Perhaps if Djuričić had not been quite so theatrical with going to ground in the first incident just seconds into the match, after a clear push in the back, then he may well have been awarded the penalty and this was clearly still fresh in the ref's mind when the second incident happened, when he was clearly clattered by two Liverpool players. Again nothing. Saints were causing the Liverpool defence all sorts of problems and by now the Saints fans were spoiled for choice for someone to boo. 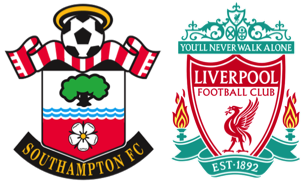 Dejan Lovren attracted a lot of early attention and Kevin Friend, our friendly referee, had certainly not done anything to endear himself to any Saints fan. Adam Lallana had become almost invisible and forgotten. A peripheral character in the proceedings. The defining moment in the game turned out to be Coutinho's goal. Although it didn't affect Saints immediately, it did change the dynamics of the game, with Liverpool's clearly shaky defence gradually getting to grips with things. Saints were still causing the occasional problem and one chance came when the ball fell to Elia bearing down on goal. Mignolet came rushing out to the very edge of the penalty area and clearly handled the ball outside the area, but both the linesman and referee were unsighted with other players being in their line of sight. Saints just couldn't catch a break. As the half came to a close it was clear that the Saints midfield was just not functioning, with both Davis and Ward-Prowse not imposing themselves on the game. We were treated to the sight of Schneiderlin warming up during the interval with one of the coaches. It was clear that he was going to start the second half and it turned out that Davis was the one to make way. Saints straight away looked to have more steel in the midfield as Schneiderlin and Wanyama combined, although the Frenchman's timing looked a bit off. Unfortunately it already looked too late, as Liverpool's hitherto shake defence seemed to be more assured and were dealing with what Saints threw at them. It wasn't until Mané came on for Ward-Prowse that Saints started to cause problems . Around this time it was clear that Djuričić had run out of steam and was just a passenger, although it wasn't until much later that Tadić replaced him after the second Liverpool goal. The break seems to have done Tadić good and he was much more involved and effective than before. As for Djuričić, I thought he looked very promising, but clearly needs some match fitness and to cut out the amateur dramatics. He kept getting himself into good positions, but is understandably not yet on the same wavelength as his teammates. That will come. The second goal was a comedy of errors, with a misplaced pass from Schneiderlin and there were others that could have cleared the threat, before the previously excellent Targett slipped and presented the ball to Sterling, who made no mistake. There were just under 20 minutes left, but although Saints huffed and puffed and looked more likely to score than they had for the rest of the match, it was a case of too little too late. They just didn't seem as quick, or as decisive from midfield forward as Liverpool, but to be honest there was not much in it, other than the inept Kevin Friend. With the trouble that Saints have been having scoring goals, IBO's own Simmo has come up with the idea we should start a crowd funding thing to buy Saints a goal. Great idea Simmo, but that might be seen as match fixing in some quarters. Maybe we need to get Sepp Blatter onside first? We could get away with anything then. Possibly. Maybe. Frustrating and disappointing as this match was in equal measures, Saints are still fifth in the Premier League and two points off third place. The end of the world has been exaggerated, but we do need to get our act together.